Can you spot a good swimming lesson provider? When you’re paying for a service, you expect good quality! So, it goes without saying that you’d want to find the best swimming lesson provider that you can for yourself or your child! But could you spot a good swimming lesson provider? Read on to learn what you should be looking for and the questions you should be asking! The Swim England ‘Learn to Swim’ pathway is the national syllabus that swimming teachers should follow in their lessons. The pathway has been structured to ensure that learners are receiving the best possible instruction with qualified teachers. Lessons that follow Swim England’s ‘Learn to Swim Pathway’ are more likely to be of a high standard and suitable for the learner’s age and ability. Learn more about the Swim England ‘Learn to Swim’ pathway here. Most swimming teachers in England hold Swim England qualifications (n.b. Swim England has recently been rebranded from the Amateur Swimming Association). Teachers who hold their Level 1 Swimming Assistant Qualification in teaching swimming are qualified to actively support a qualified Swimming Teacher in the delivery of a lesson. 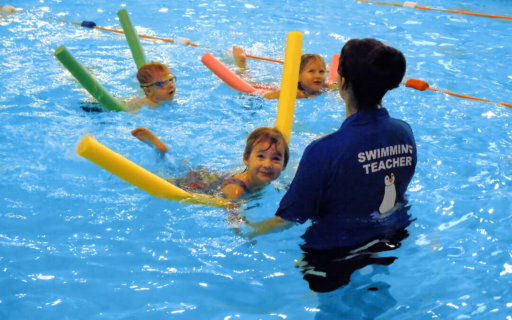 Teachers who hold their Level 2 Swimming Teacher Qualification are qualified to independently deliver swimming lessons. It is worth noting that it is not mandatory for all swimming lessons to be delivered by Swim England Level 2 qualified teachers. But, when these guidelines are adhered to the lessons tend to be of a higher quality! Before you sign up for group lessons, check the class sizes! Swim England recommends a ratio of no more than 12 non-swimmers and beginners to 1 teacher, or a ratio of 20 improving or competent swimmers to 1 teacher. You may think that these numbers seem high – so do we! Core Aquatics classes have a maximum of 4, 5 or 6 swimmers to 1 teacher, depending on swimming ability, because we know that small groups encourage a faster rate of progression! 4. Make sure the lessons are fun! Nobody learns well when they’re bored and disengaged! Keeping lessons fun and incorporating games into the lessons to support learning can be hugely beneficial to swimming progression! Ask the teachers if they use game-based learning and whether they have pool toys to use as part of their lessons. 5. Check that the lessons are comprehensive! Swimming for swimming’s sake does not make for good swimming lessons. So, check that the lessons will focus on the development of key water skills. In the earlier stages teachers should be focusing on activities such as floating, blowing bubbles, and they should also be stressing the importance of water safety! Swimming strokes should be introduced gradually once a swimmer has acquired the basic skills. These should not be introduced immediately. In the latter stages swimmers should be developing more advanced skills, including diving, forward rolls, and turns in the water. All swimmers should also be encouraged to recognise swimming as a fitness exercise! Good lesson providers should have a system in place that acknowledges swimmer progression through certificates and/or badges. They are a great way to reward achievements and motivate children when they are finding things more difficult. Certificates and badges tend to be something that can be purchased at a small cost. At Core Aquatics we acknowledge achievement via the Swim England ‘Learn to swim’ pathway certificates and badges. We also have our very own ‘Core Aquatics Award of Achievement’, which recognise interim progress between formal accredited Swim England swimming stages. These are FREE and provided to swimmers who have made exceptional milestone achievement. If you find a swimming lesson provider than meets all of the above criteria, then you can feel confident that the lessons will be of a high quality. If you’re interested in lessons with Core Aquatics, we would love to hear from you and we would be really happy to answer any questions that you may have!